It’s Bob and his tale of Gateshead kids shaming parents into litter picking; mixing leftover paint donated from sheds to cover up graffiti and motivating a local community to get together, that wins over the crowd this evening. But everyone at this Soup gathering is lending their support to small actions that lead to positive change. It’s a simple idea. Turn up and pay £4 on the door. Listen to four people pitch an idea to improve the local or wider community. Presentations are a maximum of four minutes, and the audience can ask up to four questions. Then, as you enjoy some warming soup, decide which of the four causes gets your vote. The winners get the evening’s takings to help fund their project. 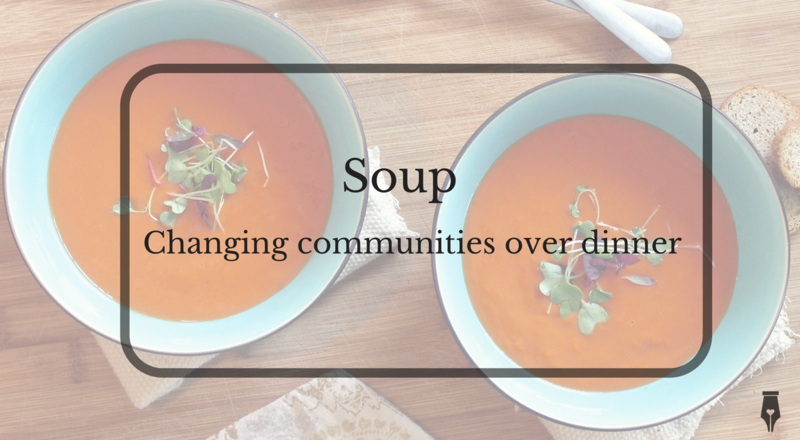 Soup, this community crowdfunding initiative, is a global event that started in Detroit. Newcastle’s version is hosted by Ernest, the Ouseburn based independent cafe/bar. They not only generously provide free soup, but also the space to host the event, plus staff to promote it on social media and help out on the night. When I started my freelance business, I quickly became aware of the brilliant, supportive and largely hidden community of local entrepreneurs who were going it alone, getting out there and getting things done. It’s more than apparent that this positive spirit expands beyond the commercial world into doing good in the community too. Lendwithcare a crowdfunding initiative to provide loans for people in the developing world, to help them establish or expand a small business and work their way out of poverty. Okay, so I’m there to support the Lendwithcare team. It’s an initiative I support and I’ve been privileged to see first-hand the difference that it makes to people’s lives when I travelled to Cambodia and Vietnam. For the speakers at Soup it’s not only a chance to attract money to help fund a project, but an opportunity to speak about a cause they care about to a room of like-minded people. Our cause may not have won the pot, but plenty of people came to ask more about Lendwithcare, and I think we may have solved a few of those ‘difficult to buy for’ Christmas present dilemmas by suggesting Lendwithcare gift vouchers. Having by chance stumbled upon the Love Your Avenues team in action, painting street furniture in their local area, I was glad to see them win a small fund that will make a big difference in helping them spread the word to bring a sense of pride to their local community. For the Soup audience, it’s a relatively cheap night out, with food, entertainment, a chance to learn something and the warm satisfaction of contributing to some positive local action. There are local versions all over the UK, so give it a try.